Fig Newton lovers can have their cake and eat it too! 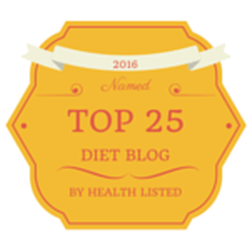 If you are on a paleo diet you’re in for a treat! Here’s an easy paleo fig cookie recipe that is of course gluten-free, grain-free and dairy-free, bursting with flavor and kids love to help make these too. 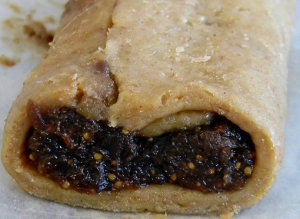 The sweetness of figs and dates combined with citrus blended with a bit of an almond flour based dough is extremely delicious. Furthermore, you get a dose of protein from your almond flour and the figs and dates are packed with minerals and nutrients as my buddy and recipe creator, Gray Hayes states. Fig cookies, get ready to meet your nemesis! These paleo cookies have the entire flavor and texture that fig lovers want, but without the artificial flavors or added preservatives. 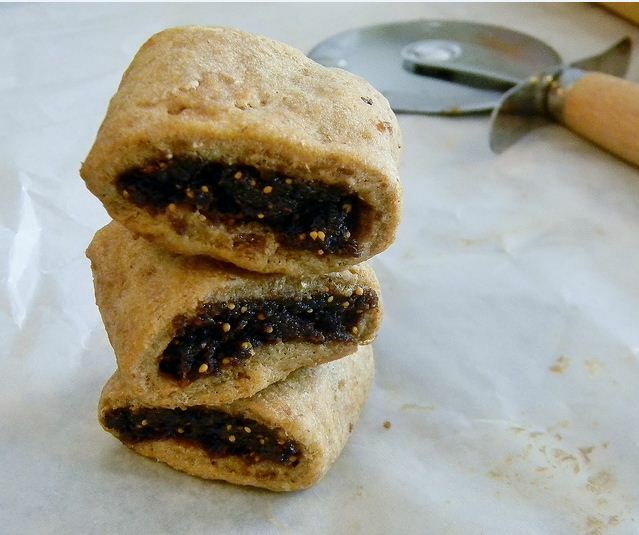 These paleo fig cookies were born out of my own love for Fig Newtons and other pie-like treats filled with sweet fruit. Dates and figs are quite versatile. Their spicy sweetness is perfect to juxtapose with contrasting flavors such as sharp cheddar cheese, salty feta cheese and spicy crackers. They are also naturally low in calories and super packed with fiber. Magnesium, zinc, calcium, iron and potassium are just a few of the essential nutrients that these small-but-powerful delights pack. For this particular paleo cookie recipe, I used one cup of dried figs and three Medjool dates (pitted) for the “meat” to stuff the cookies. The recipe also calls for just a half cup of orange juice to break up the sweetness of the dates and figs; it also adds a bit more variety to the flavors without taking away their original tang. Prepare for your kitchen to smell heavenly during the step which involves cooking the fig mixture on your stovetop, not to mention how amazing your kitchen will smell once the cookies are baking in the oven! 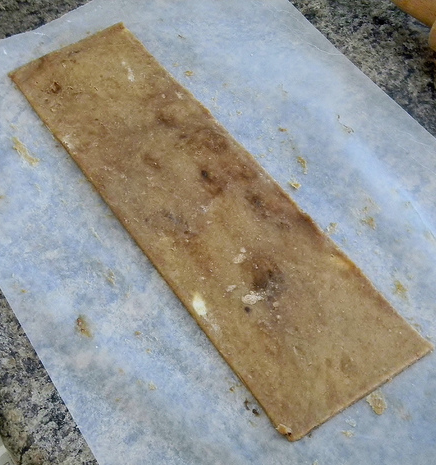 Dough is rolled and flattened out into a rectangle on parchment paper. 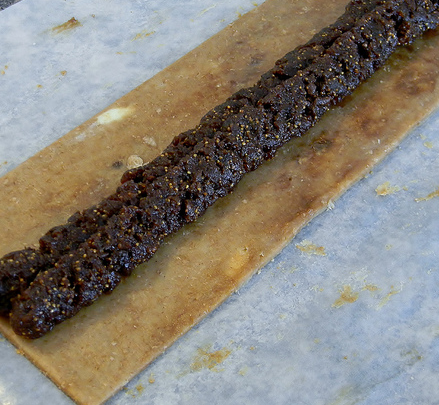 Fig mixture is spread on the dough. Once you’re ready to serve the fig cookies, you could pair them up nicely with paleo vanilla bean ice cream or even some cinnamon vanilla cashew milk. Well, let me introduce you to the recipe. Here it is below! Gray Hayes is an entrepreneur and paleo practitioner living in Atlanta, GA. He’s an avid traveler and reader. When not eating real food, traveling or reading, Gray is spending time with his non-paleo wife and daughter, which creates its own hilarity and challenges. For more paleo meal and dessert ideas, you can visit Gray’s blog: http://www.myeasypaleomeals.com/. You can also reach out to Gray on Twitter, Facebook, Pinterest or Google+. Have fun with this recipe and let me know how it goes for you! 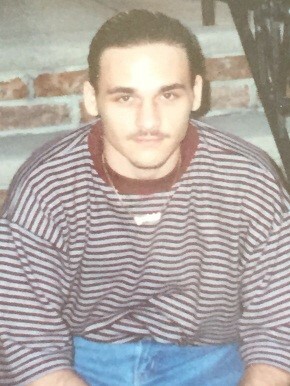 Would love to see pics as well. Send me a message here. These healthy paleo fig cookies were inspired by the famous Fig Newtons that most of us are familiar with. Packed with fiber, magnesium, zinc, calcium, iron and potassium, these paleo delights are a perfect treat for little ones and adults alike. The baking step is one of the best parts! Your kitchen will smell heavenly thanks to the aromatic blend of dates, figs and orange juice. Combine the eggs, coconut oil, syrup, and vanilla extract with a blender or food processor. Once thoroughly blended, add the almond meal, baking soda, and salt to the wet mixture. Mix again until all of the ingredients are completely combined. Upon completion, you should have a nice doughy texture. While your dough is in the refrigerator; begin working on the filling by combining the figs, dates, and orange juice in a small saucepan over medium-low heat. 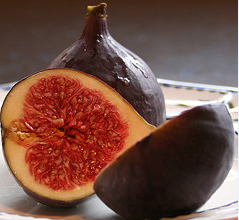 Allow the fig mixture to simmer for approximately 10-12 minutes until the figs are softened and the juice has reduced. Transfer the fig mixture from the saucepan into a blender or food processor. Combine until smooth. While blending the fig mixture, pre-heat the oven to 375F degrees. Once the fig mixture is smooth; set aside. Take the dough from the refrigerator and set onto a sheet of parchment paper. Cover your dough with a 2nd sheet of parchment paper and use your hands or a rolling pin to form the dough into a long thin rectangle. Note: The rectangle should be approximately ¼ inch thick. Once your cookie dough is formed into a rectangle, take your fig mixture from the blender and spread it along the middle of the rectangle. Pinch the ends of the cookie dough together to seal in the filling prior to baking. Place the long fig cookie into the oven and bake for approximately 15-18 minutes or until the cookie is golden brown. Once brown, remove from oven and set aside to cool for at least 20 minutes before serving. Once cooled, slice the cookie into the desired amount of pieces and store in an airtight container. There are two ways you can keep these and any other types of cookies fresh: One is freezing them. That is what most people do with Girl Scout Cookies so they last all year long. The second is storing them in an airtight container. The freshness will depend on the amount of times they become exposed to air each time you open that cookie jar. Correct and if you read the full post you will see why this is. This was a guest post and provided by Gray Hayes of easy My Easy Paleo Meals.